Testimonials – Dayna Young, M.M. “Dayna Young is a remarkable violinist who enthralls her audience every time she plays. Her instrument and she are as one. I have heard many violinists and it is immediately obvious that her music, her range of expression and tone, etc are of the highest of professional levels. Her touch is really outstanding. Dayna has tremendous physical and mental energy and many other talents. She takes a great interest in others, is patient, and just loves to share her music and love of music. She is an ideal teacher.”— Frances S.
“I’m a hobby pianist and would consider my level to be early advanced. I took formal lessons from ages 7 to 19 years old. My ecclesiastical volunteer work has given me the opportunity to accompany many different choirs, vocalists and instrumentalists throughout the years, playing for audiences from sizes of 20 to 800. When I met Dayna and her great family four years ago in England, I was thrilled by the many opportunities I had to accompany and perform alongside her. We performed several individual pieces together as well as two full recitals. Working with and accompanying Dayna was an absolute treat. Even though I wasn’t a formal “student” of hers, every time we rehearsed or performed she taught me a great deal and truly stretched my abilities. She had a way of truly inspiring me and bringing out the best musician in me. I can honestly say, I’ve never performed better than when it was with her. Dayna is a true professional, performing with precision and tremendous technical expertise. Her technique is never rote or strictly mechanical, but rather her music has a depth of beauty, passion, power and strength that’s wonderful to hear. 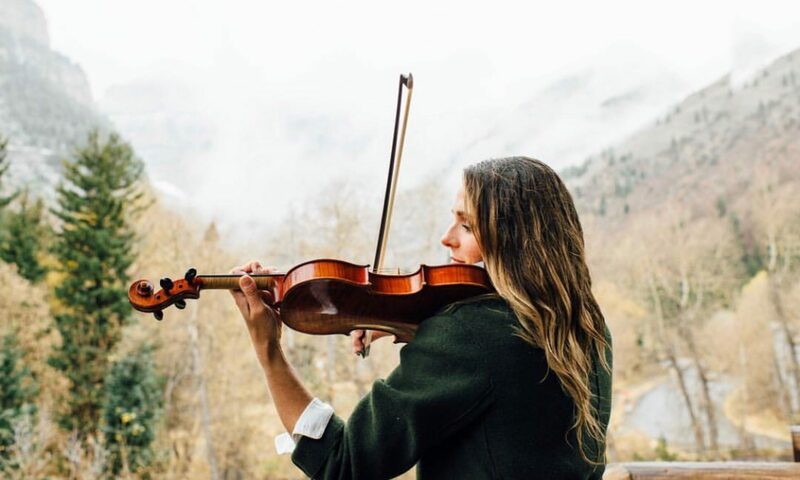 My recommendation of Dayna as a teacher and performer comes completely without reservation.” —Lauritz P.
“I was not particularly fond of the violin until I heard Dayna play, it was the first time the instrument really spoke to me. It was a standard beyond my expectation.” —Alex S.
“Dayna is the best private music teacher my kids have ever had. I can not say enough good things about her gift of teaching. As soon as I found out Dayna was accepting music students, I made sure to enroll my oldest two children. Then, as the younger two grew old enough, I added them too. I saw how much the children were learning and growing, and I added myself to her studio as well! Dayna sees each of her students as an individual and caters her teaching style to each of them. They each feel so much love from her. She is very specific with her feedback, and so positive. Her studio was professional, and the children felt they were a part of something wonderful–a world of musicians. My children wanted to do well at each lesson, because they knew their teacher was interested in their success. I remember thinking multiple times that she had given them pieces that were way above their skill level, but in each instance I was wrong; Dayna took the opportunity to push the kids a little further with each piece, and as a result they grew more than I realized they could. Dayna also did a fantastic job helping my children understand that music is a gift to be shared. She encouraged them to play for others whenever they had the opportunity. They have each developed a love of music that I can attribute to their days in Dayna Young’s music studio.” —Emily H.
“Mrs. Young is not only knowledgeable as she teaches, but she is also kind. You can tell she cares about music and shares that love of music with her students. I currently have 4 of my kids taking lessons from her and they have been progressing with each lesson. I would be happy to recommend others to be taught by her.” – Amy P.
“Dayna is a fantastic teacher! As an adult with young children, I had lots going on and I was apprehensive about starting lessons after being away from piano for so long (I had taken lessons as a child). But, Dayna was always encouraging, always understanding, and always pushing me to learn more. She found music for me to play in the style I love (musicals) and it really added to my enjoyment and sense of accomplishment as I mastered pieces. Her style of teaching is so wonderful-she is organized and keeps track of what skills are being worked on. When I was frustrated with a passage that I just couldn’t get she would simply say ‘Let’s take a look at it a different way’ and would have me change the rhythm, or break it into smaller pieces, or present some other way to work on learning it. Her love of music is obvious and it’s clear she loves sharing it with others! I loved learning piano from her and would recommend it to anyone!”–Jenny R.
“Dayna does not underestimate your ability even when you do. She gives direction in a kind manner, she pays attention to what her students needs are, and she adjusts the lessons for the learning needs of her students. I love working with Dayna and would absolutely recommend her to anyone who wants to learn to play piano or violin.” — Laura A.